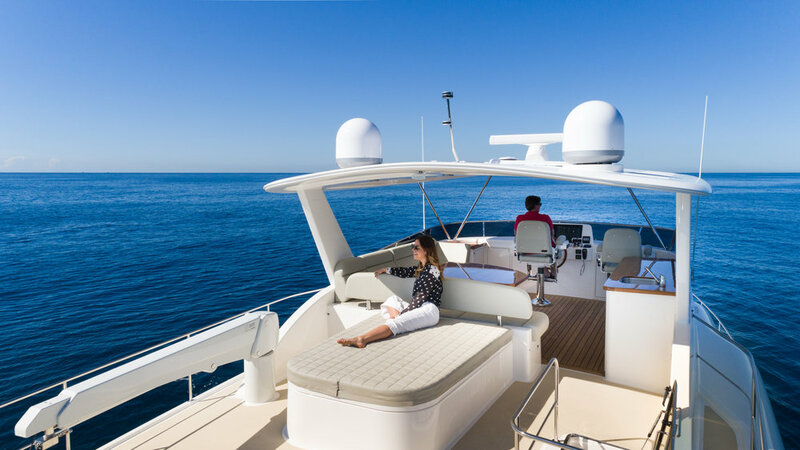 The Grand Banks 60 has been in the market for over a year now as the most innovative 'trawler'; unmatched in her performance, efficiency and design. We are currently sold out for all of 2019 production and are currently working to fill 2020 production slots. There are only two Grand Banks 60's that are AVAILABLE NOW. After these two are sold, the soonest a GB60 can be at your dock is 18 months (around June 2020). These amazing boats, extensively equipped with all the options, will not last long so contact me today to get aboard your new GB60. The GB60 is an exciting addition to the Grand Banks line. Several custom layouts available, cruising speeds from 25-30 knots with fantastic fuel economy and very shallow draft. Contact Steve today for all the details on this next generation of Grand Banks Yachts. Steve sold Hull #02 & #05, check out the details of the deliveries below. This new model had its first USA debut at the Newport International Boat Show in September, 2017 and it was fantastic! We had lines down the dock to see her and received lots of positive feedback. Ever since, we have had an outstanding amount of support from the industry, Grand Banks followers and the like. Steve is very excited for the future of this model. This is a true turning point for Grand Banks, as the company's 60th Anniversary was this past year. 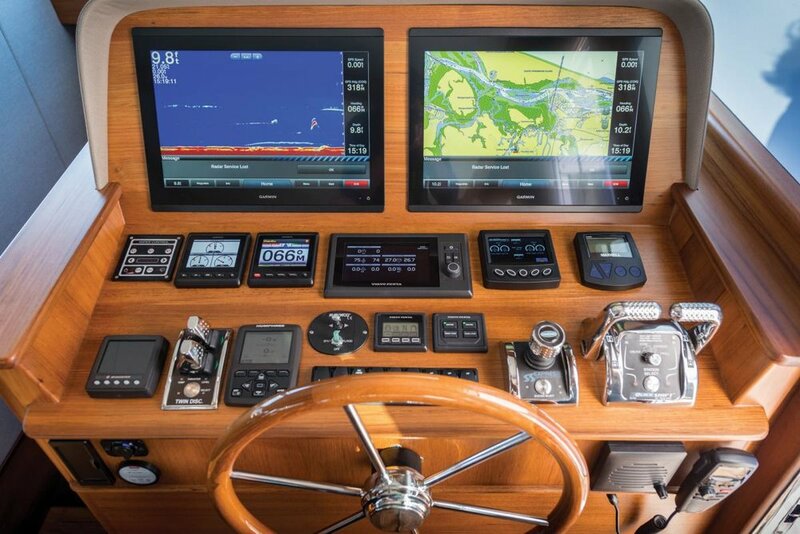 This all-new design offers a glimpse of the future; it marries advanced marine technology with Grand Banks traditional styling and craftsmanship. It is the first model that Mark Richards has fully designed since he took over Grand Banks as CEO about three years ago. 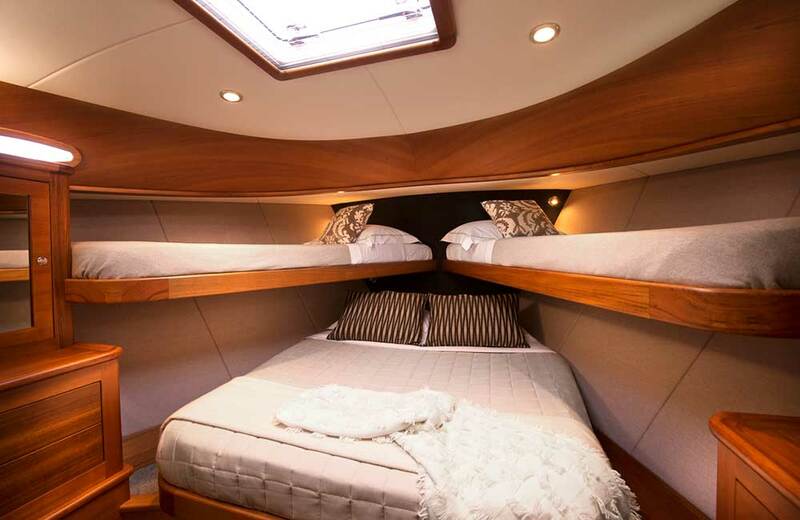 He incorporated the warped hull, a design he has been using on the Palm Beach Motor Yachts for the past 22 years. This innovation, along with many other features and benefits, has made this yacht revolutionary. Now, not only does Grand Banks have a more modern, yet still classic traditional design it also has incredible performance which is honestly draw dropping! She is a MUST SEE MUST RIDE boat! There have been several great articles written about the all new 2018 model GB 60. Links to them can be found below. Hull #02 has a forward galley up, 2 stateroom, 2 head layout with storage utility space in place of third stateroom berths. She has a very spacious aft deck with large bench seat with inlay teak table. Looking forward on the aft deck there is a wet bar to port with docking control station, with stairs leading to flybridge on starboard side, as show below. Entering the salon (below) to find a dueling settee with folding teak table on starboard side and a space for two chairs to port with galley forward to port. Across from galley is more refrigeration just aft of helm. Down below is a converted third stateroom into a utility room (right) with extra storage, two additional fridge and freezer drawers, and separate washer and dryer. The VIP forward stateroom has a low queen island berth with a mirror on the bulkhead. The day head is just before the VIP stateroom on port side, just forward of the utility room and has a full separate stall shower. The Master stateroom is midship port side with ensuite head and walk in closet. The aft galley layout with second helm seat gives the space below to make the walk down / in closet as you can see below. The forward galley layout takes away the head room for the walk down closet but allows for a full wall of hanging closet space, as you can see in the photo to the below. Both layouts are fantastic and provide very generous storage for all live aboard essentials! One of the great things about building a new yacht is how having the opportuinity to choose what layout work best for you, after all it is all about how you and your family and friends will use the space!